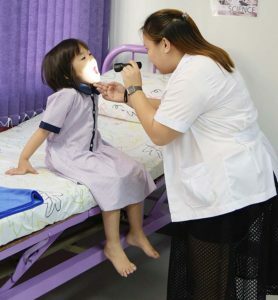 The Health Clinic is staff with a qualified, registered nurse who provides evaluation, treatment, and basic first-aid for acute health problems occurring during the course of the school day. This service is available to all students from Day Care to Secondary, teachers and staff. Please note that our school clinics do not prescribe medication but will be able to provide initial triage. Copyright © 2019 Siam Singapore International School.